So at last our son was with us. The months of anguish had given way to the joy of a new birth. But this was far from normal. Instead of smiling friends and relatives bearing flowers and teddy bears before the proud parents taking their new child home we were left in a distant city watching our tiny son struggle for life through the walls of an incubator. The good news was his heart seemed stable and the threat of early surgery was gone. But he was tiny, about 3 pounds. And there was no explanation. His blood glucose levels had been taken soon after birth and were 1.9mmol/l (~34mg/dl). This was in the early morning. He had been given an extra boost of dextrose to get them up and then a slow rate of IV dextrose. His BGL came up to 5.0 (90). This was good, but...by 4.30pm he was 14.1 (~250), by 6.50pm he was up to 18.6 (~330). 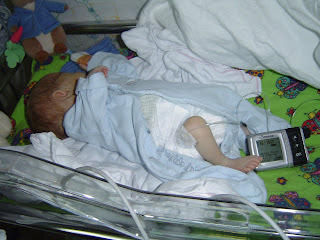 By 9.30pm he was 21.3 (~380) and neonatal diabetes was mentioned for the first time. He was started on insulin and after peaking at 24.6 (~440) just before midnight he started to come down, reaching 7.7 (140) by 6am. Quite a ride for his first day in the world! We were expecting to be dealing with a baby with a heart condition. Now we had a tiny baby with neonatal diabetes....and a heart condition. I also had to look after our other two tired, confused and excitable children in a strange city while Vicky recovered in the hospital. Looking back I wonder how we got through. At the time I wondered if we would. Over the next week Finlay struggled along, each day seeming to bring a new problem. His blood sugars swung wildly from hypos to the 20s (360 to 500+). In such a tiny baby a small bit of insulin makes a huge difference, getting the balance right was near impossible. He was growing, but only very slowly, his stools were fatty and colourless, suggesting he wasn't absorbing his food and his liver might not be working properly. At six days old he had an ultrasound of his abdomen to see if his liver was ok. The good news was that his biliary tree (the plumbing that drains bile from the liver to the intestine) looked to be in working order but they told us he was missing his gall bladder! This hit us hard as we had gone from a child with a heart condition to one with diabetes as well and now we were being told there was a third issue. How much could one child take? And there was still no real explanation for his inability to digest his food properly. On day eight we were given a reason. The pancreas is responsible for producing insulin. It is also responsible for enzymes that digest food in the intestine. The fact that he was diabetic and wasn't digesting his food suggested that perhaps is pancreas was missing too!! This was my lowest point. Our son had multiple heart defects and we were being told he was now missing two other organs. How could he survive? All I could think was the next meeting we would be sat down and told to prepare to say goodbye. We went back to where we were staying with our other two boys, trying to be as normal for them as we could. I can't remember much of that night but I doubt I slept much. The next day we were ushered into a room with the neonatologist that had been looking after Finlay. "This was it" I thought. He sat us down and explained that he'd searched the medical literature. In his understated words Finlay "isn't on the first page of the textbooks". He then gave us a paper he had found in an obscure German journal. It detailed the story of a German girl born with an almost identical diagnosis to our son. No pancreas, no gall bladder, serious heart defects. At the time the paper was written this girl was 2.5yo. Still alive!!! All of a sudden we had gone from desperation to hope. This little girl had given us more than we had dared hope for. The paper also had a review of all the cases they could find of children born without a pancreas. There were 14 dating back nearly 40 years. Sadly most had died but it was clear that the more recent cases had a much greater chance of surviving. The doctors told us the first 6 weeks would be critical but if we could get past that there was every chance he would be ok.
First he needed an MRI to see if they could find any pancreas. To keep him still this required his first general anaesthetic at 9 days old. Several hours, and one collapsed lobe on his right lung, later they had failed to find any pancreas. So we had our diagnosis. At last we could get on top of his treatment rather than just chasing his symptoms. He was given pancreatic enzyme supplements with his feeds and, at 10 days old and weighing just 1.53kg, became one of the youngest and smallest children to go on an insulin pump. Credit must go to the staff at the neonatal unit at Auckland hospital. None of them had ever seen an insulin pump before and suddenly they were responsible for using one to keep a critically ill baby alive. The suppliers put together a step-by-step guide for it and on it went. No practice runs with saline, just straight into his thigh and pumping away. We were all learning: nurses, parents, endocrinologists, neonatologists. In all he spent 8 weeks in neonatal intensive care: 6 weeks in Auckland and 2 more once we were transferred home to Christchurch. 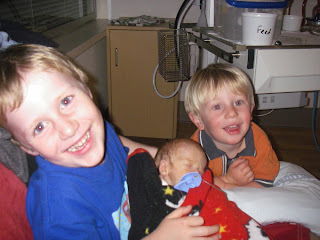 Then on June 1st, 2008 we finally brought our third son home. What a journey for you all... For your beautiful son, so tiny and hooked up to that animas! And thats just a part. Im so glad i found your Blog. What an incredible journey. Thank you so much for sharing your story. You are a truly inspirational family! Just wonderful! !